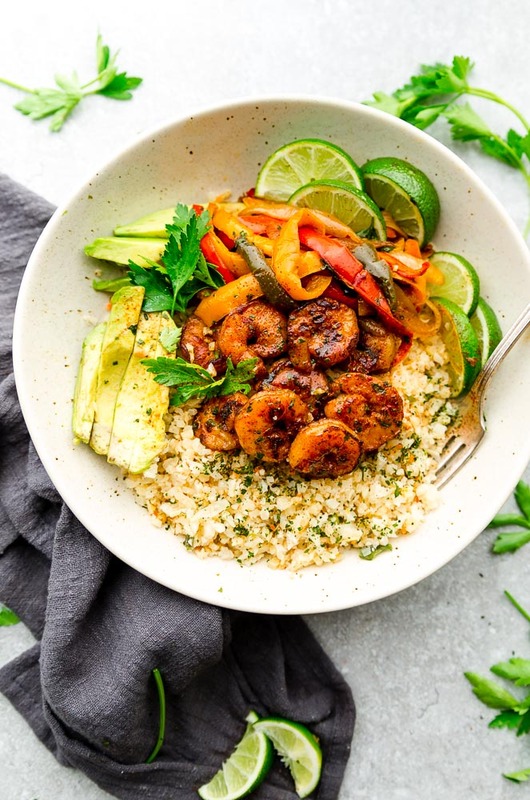 Low Carb Chipotle Lime Shrimp Bowls are full of flavor with cauliflower rice, bell peppers and avocado. Best of all, they’re easy to customize and whole 30, paleo and keto friendly. Raise your hand if you’re a fan of Chipotle’s Burrito Bowls or Chili’s Chipotle Shrimp Bowls? ???? My husband is obsessed but lately, he’s been trying to dabble into more low carb and keto meals. He’s doing really well and has cut back a lot on the tex mex rice bowls he used to order. And if you’re following a paleo or low carb diet, making your own healthy fresh shrimp bowls at home couldn’t be easier. 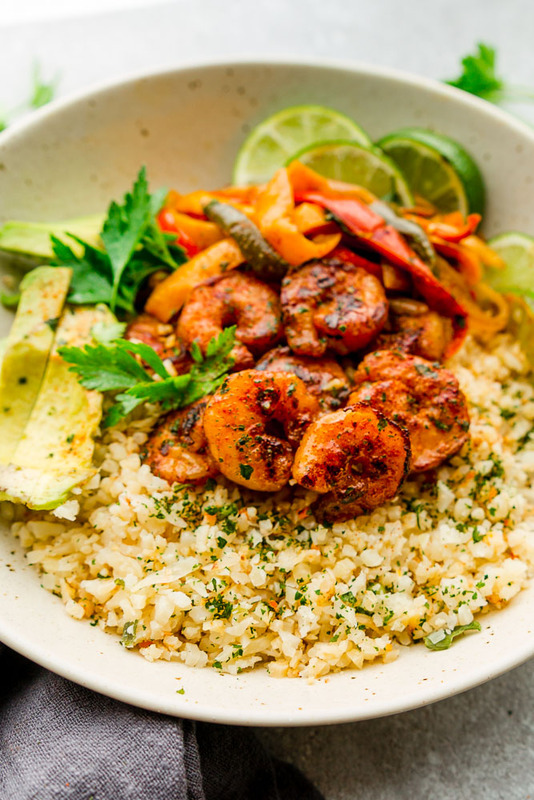 This Low Carb Chipotle Lime Shrimp Bowl is fresh, flavorful and simple to customize. It comes together in about 30 minutes so it’s also great for busy weeknights. Start off by tossing the shrimp together with all the seasonings. You can also use your favorite store-brand if you’re in a pinch as well. The seasoning is just some chipotle peppers, chili powder, salt, pepper, garlic / onion powder, cumin, smoked paprika and some lime. Chop the peppers and onions then saute them until they are tender and cooked through. Sear the shrimp until they have a nice char. This recipe would also work great for meal prep. Just divide into lunchbox containers and store in the fridge for up to 3 days. You can even switch up the vegetables or serve it alongside zucchini noodles or broccoli rice instead. 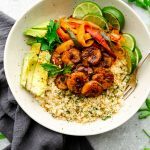 Low Carb Chipotle Lime Shrimp Bowls are full of flavor with cauliflower rice, bell peppers and avocado. Best of all, they're easy to customize and whole 30, paleo and keto friendly. In a medium bowl, combine shrimp, salt, black pepper, chipotle peppers, chili powder, cumin, garlic powder, onion powder, paprika and lime. Set aside. Slice the onions and peppers. Heat 1 tablespoon oil and cook peppers and onions 4-5 minutes, stirring regularly, or until they're crisp-tender. Transfer to plate. Wipe down the pan as necessary. Heat butter and remaining oil in same skillet over medium heat. Working in batches, sear shrimp and cook for 2-3 minutes per side. Transfer to plate, and continue cooking remaining shrimp, adding more oil and /or butter as necessary. When all the shrimp is cooked add everything including the peppers back to the pan and tossing very gently until heated through. Add a splash of lime and adjust seasonings. Serve over cooked cauliflower rice with cilantro, lime wedges and avocado, if desired. Very easy recipe. Hubby absolutely loved it, as did I. We are mainly keto so this fit our woe perfectly. Didn’t make the cauliflower rice. Had a nice salad to accompany along with a glass of pino grigio.